Amphisbaenians, aka Worm Lizards, are not really lizards, and definitely not worms. They are a group of reptiles closely related to lizards and snakes, but classified in a suborder all their own. Most of them are legless denizens of the tropics. All of them spend almost all of their time burrowing underground, so they are hard to find. 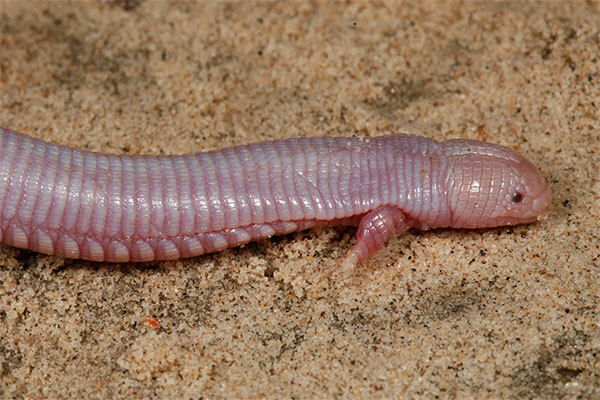 The USA is home to a single species: Rhineura floridana, the Florida Worm Lizard, which I have not seen. I have also not seen any of the others. The coolest amphisbaenians are in the genus Bipes (endemic to Mexico) and have two tiny little front legs that look simply ridiculous on their long wormy bodies. Here's a picture of Bipes biporus taken by my friend Matt Cage and used with his permission.